قربان‌نیا, ناصر. (1392). حقوق طبیعی و حقوق بشر. دوفصلنامه حقوق بشر, 08(2), 41-58. ناصر قربان‌نیا. "حقوق طبیعی و حقوق بشر". دوفصلنامه حقوق بشر, 08, 2, 1392, 41-58. قربان‌نیا, ناصر. (1392). 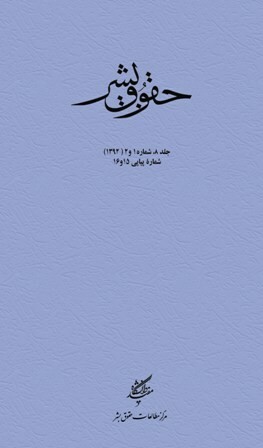 'حقوق طبیعی و حقوق بشر', دوفصلنامه حقوق بشر, 08(2), pp. 41-58. قربان‌نیا, ناصر. حقوق طبیعی و حقوق بشر. دوفصلنامه حقوق بشر, 1392; 08(2): 41-58. بی‌بهرگی حقوق بشر از مبانی فلسفی و انسان‌شناختی مایه ضعف، سستی و آسیب‌پذیری آن است. به این پرسش که از لحاظ منطقی چگونه از انسان بودن انسان به صاحب حق بودن او می‌رسیم، پاسخ‌های متعدد داده شده است. باور به حقوق طبیعی توجیهی است که طرفدارانی صاحب نام دارد. البته بر سر راه مدافعان حقوق طبیعی چالش‌های بعضاً جدی وجود دارد؛ اما در عین حال می‌توان با اعتقاد به حقوق طبیعی به عنوان یک مبنای حقوق بشر، دسته‌ای از حقوق بشر را روایتی نو از آن دانست. ادعای این مقاله آن نیست که میان حقوق طبیعی و حقوق بشر نسبت «این همانی» وجود دارد. مفهوم حقوق بشر متفاوت از حقوق طبیعی است. سخن در رابطه وثیقی است که میان حقوق بشر امروزی و نظریه اولیه حقوق طبیعی که رد پای آن را در حقوق اسلام نیز می‌توان دید، وجود دارد. تا جایی که می‌توان حقوق طبیعی را مبنا و توجیه‌گر بسیاری از حق‌های مصرح در اسناد بین‌المللی حقوق بشر دانست. Any human rights bereft of philosophical and anthropological foundations are susceptible to weakness and vulnerability. The question as to how from a logical point of view we arrive at the conclusion that the fact of being a human accords us with rights is one that has been provided with several answers. Belief in the natural rights is justification for some prominent proponents. However, in spite of serious challenges facing the proponents of natural rights, it is possible to consider them as one of the foundations of human rights and, in turn, view certain human rights as a modern interpretation of natural rights. In this article, we do not advance the claim that the relationship between human and natural rights is one of identity. The notion of human rights is distinct from natural rights. None the less, it is possible to detect a close relationship between the modern human rights and the ancient theory of natural rights whose traces may be recognized in Islamic law, so much so that belief in natural rights may be said to constitute the foundation and justification for many explicit rights in international human rights documents. The author tries to demonstrate that seeds of human rights have been scattered in the rich soil of the theory of natural rights, being effective in flourishing human rights; therefore, not be separated from its roots, not needless to it. رضا داوری اردکانی، رضا؛ «ملاحظاتی درباره حقوق بشر و نسبت آن با دین و تاریخ»، چاپ شده در «مبانی نظری حقوق بشر» مرکز مطالعات حقوق بشر دانشگاه مفید، 1384. جعفری لنگرودی، محمد جعفر؛ تاریخ معتزله - فلسفه فرهنگ اسلامی، تهران، کتابخانه گنج دانش، 1338. کاتوزیان، ناصر؛ فلسفه حقوق، تهران، شرکت سهامی انتشار، 1377جلد 1، 1377. «مبانی نظری حقوق بشر»، مرکز مطالعات حقوق بشر دانشگاه مفید، 1384. محقق داماد، سید مصطفی؛ «فرازمانی و فرامکانی بودن اصول حقوق بشر»، چاپ شده در «مبانی نظری حقوق بشر» مرکز مطالعات حقوق بشر دانشگاه مفید، 1384. مطهری، مرتضی؛ بیست گفتار، صدرا، قم، 1358. _______؛ نظام حقوق زن در اسلام، قم، صدرا، 1381. موحد، محمد علی؛ در هوای حق و عدالت، نشر کارنامه، 1381. اصفهانی، محمد حسین؛ نهایه الدرایه فی شرح الکفایه، چاپ سنگی، بی‌تا. طوسی، خواجه نصیرالدین؛اخلاق ناصری، چاپ بمبئی، 1267ه. ق. میرزای قمی؛ قوانین الاصول، جلد 2، چاپ عبدالرحیم، بی‌تا. Mosler, H; 1974, The International Society as a Legal Community, Recueil des Cours, Collected of the Hague Academy of International Law, vol. 140. Lioyd, Dennis; 1965, Introduction to Jurisprudence "With Collected Texts", London, Stevens and Sons. Aquinas; The Various Types of Law, Summa Theological, Translated by J. G. Dawsoned, Quoted in Dennis Lioyd: op. cit. Weeramantry, E. G; 1997, Justice Without Frontiers؛ Furthering Human Rights, Vol. 1. Gould, Harry D; 1999, Toward a Kantian Internatianal Law, International Legal Theory , Vol. 5, No. 2. Nardin, Terry;1999, The Rule of Law in International Relations, vol.1. Casesse, Antonio; 1990, Remarks on Scelle's Theory of Role Spilliting, E. J. I. L.
Friedmann, W; 1964, The Changing Structure of Internatinal Law, London Stevens. Barker, J; 2000, International Law and International Relations, Continum, London, 2000. Simma, Bruno; The Contribution of Alfred Verdross to the Theory of International Law, EJIL, No. 6. Friedman; 1960, Legal Theory, London. Hart, H. L. A; 1961, The Concept of Law, Clarendon press, Oxford. Brierly, James; 1963, The Law of Nations, Oxford, Clarendon press. Zabo; 1982, Historical foundations of human rights and subsequent developments, in vasak, K(ed): the international dimentions of human tights, vol. 1. Henkin, L; 1981, Interoduction, In Henkin (ed): The international bill of rights.